According to Invertek , a 10 ton hoist at the Sterkfontein Dam Waterworks in South Africa has achieved massive performance and safety benefits following the retrofit of an Optidrive Plus 3GV AC Drive. Situated at the bottom of the Sterkfontein dam wall, the hoist is used to remove big valves and other equipment for overhaul and general maintenance. 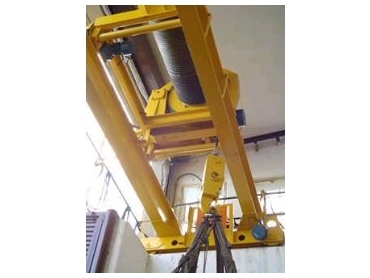 A key challenge in this application is the fact that the hoist has to provide a total lifting distance of 98 metres! The 37 kW, 380 Volt Optidrive Plus 3GV, supplied for the project through Datona Crane Services, is able to produce full torque on the motor before disengaging the brake on the hoist, without the use of an encoder or closed loop variable speed drive. Further more, the customer was amazed at the incredible improvement in performance due to the elimination of the shock loading that they had previously experienced when using contactor control. "The customer was totally delighted to see the infinite amount of control that the Optidrive Plus 3GV gave them during their 11.5 ton load test and this not only in the hoisting motion, but also in the lowering motion too." said Mark de Beer, General Manager of Invertek Drives in South Africa. Mark continues: "We have been very successful in the use of the Optidrive range of products within the crane industry throughout South Africa. Needless to say, we have received a lot more enquiries regarding the use of Optidrives revolutionary technology in hoisting applications, and expect to rapidly grow our share of this market over the coming months."